Concise, clearly stated and about as well stated as possible…God’s love is always the answer. This entry was posted in News & Views, Quotes, Spirituality & Religious Writings and tagged Albert EEinstein, answers, cold, creation, darkness, evil, God, heart, heat, light, love on September 11, 2016 by Ray Buchanan. How many of us have bought into the philosophy that the one with the most toys wins? Our entire society operates on the principle that our lives would be so much better, and that we as individuals would be more complete, if we could just get the next best thing. We have been brainwashed into believing that we must buy more to live. We live to buy rather than buying to live. The issue I have with this lifestyle is that it isn’t Christian, and in a world of poverty and hunger, it is actually immoral. If our spirituality actually informs our lifestyle we should be striving to live more simply. 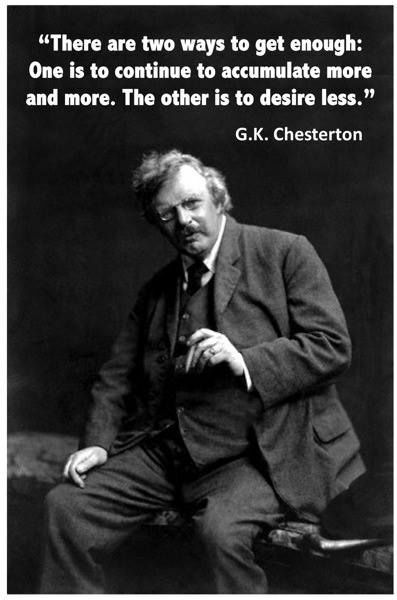 That’s what Chesterton is saying. Desiring less is the best way to have enough. By living more simply we make it possible for others to simply live. Our world was created perfectly. There is enough resources to meet our needs, but there will never be enough to meet our greed. This entry was posted in Hunger & Poverty, Quotes and tagged acquiring, buying, contentment, creation, desire, enough, envy, G. K. Chesterton, greed, happiness, hunger, joy, lifestyle, more is less, need Christianity, philosophy, poverty, quote, resources, spirituality, world on March 4, 2016 by Ray Buchanan. What could be a greater legacy than being part of the global movement that ends hunger forever. We can create a hunger-free world. Let’s make it happen. 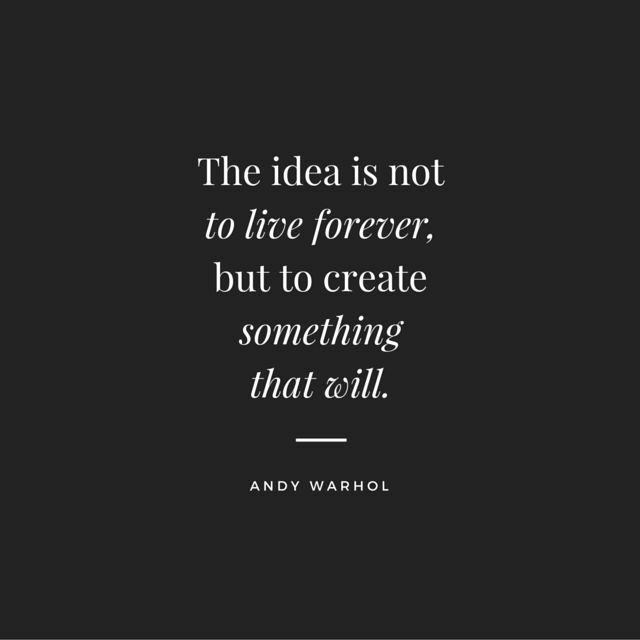 This entry was posted in Hunger & Poverty, Quotes and tagged Andy Warhol, creation, eternity, forever, global movement, hunger-free world, idea, legacy, life, quote on November 4, 2015 by Ray Buchanan. we live and move and have our being. to lives of misery – hungry, sick, and utterly without hope. even members of their own family. for those wounded in body and for those wounded in mind. for an end to bullying, and torture in all its forms. This entry was posted in Hunger & Poverty, Prayers, Spirituality & Religious Writings and tagged bullying, children, compassion., creation, cruelty, enviroment, exploitation, generosity, God, hearts, homelessness, hunger, Jane Goodall, killing, life, love, misery, nature, peace, poverty, power, prayer, prostitutes, rejoicing, sick, slave labor, spirit, torture, trust on September 20, 2015 by Ray Buchanan. 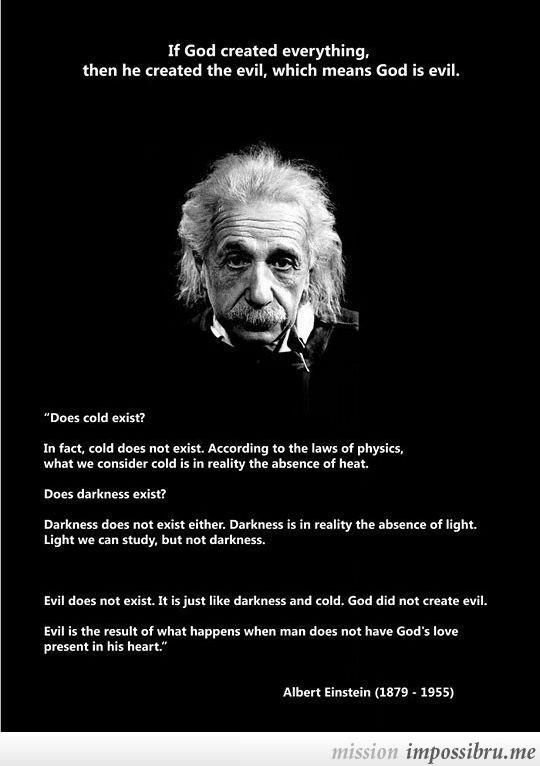 Einstein is right on. A holy curiosity helps keep one’s life and one’s problems in perspective. And that is a good thing. The Bible says we are fearfully and wonderfully made. Having a holy curiosity allows us to find true joy in the mysteries of the glorious creation of which we are but a small part. 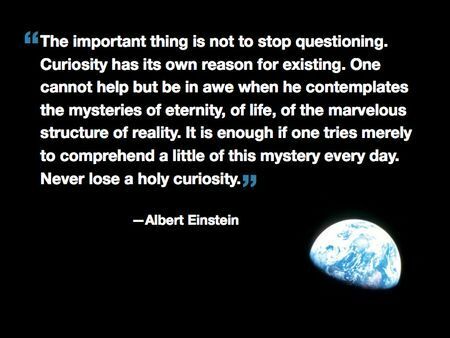 This entry was posted in News & Views, Quotes and tagged Albert Einstein, awe, bible, creation, curiosity, eternity, holy curiosity, life, mystry, questioning, reality on June 5, 2015 by Ray Buchanan. 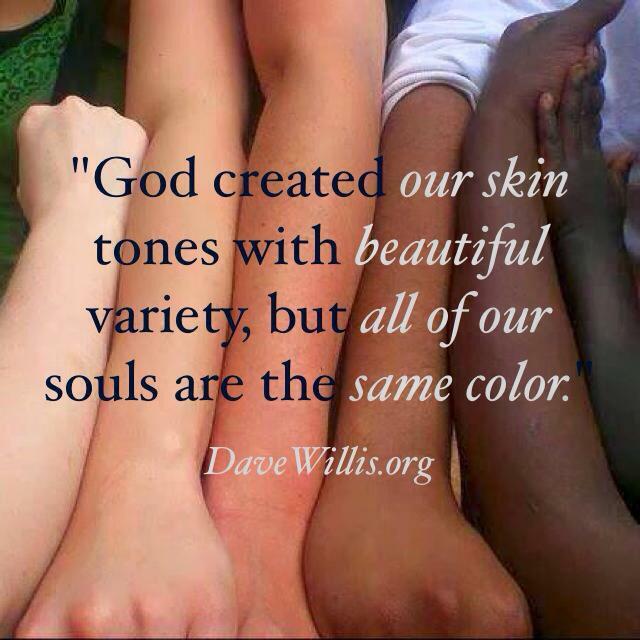 This entry was posted in Hunger & Poverty, News & Views, Quotes and tagged creation, DaveWillis.org, God, human family, skin tones, soul on May 19, 2015 by Ray Buchanan. Our world was created perfectly. There’s more than enough food for every person on the planet. No one should ever die of hunger. Feeding the hungry is not charity. It’s doing what’s right. Working together we can end the moral obscenity of hunger forever. It’s the only right thing to do, and it’s not about charity. It’s about justice. 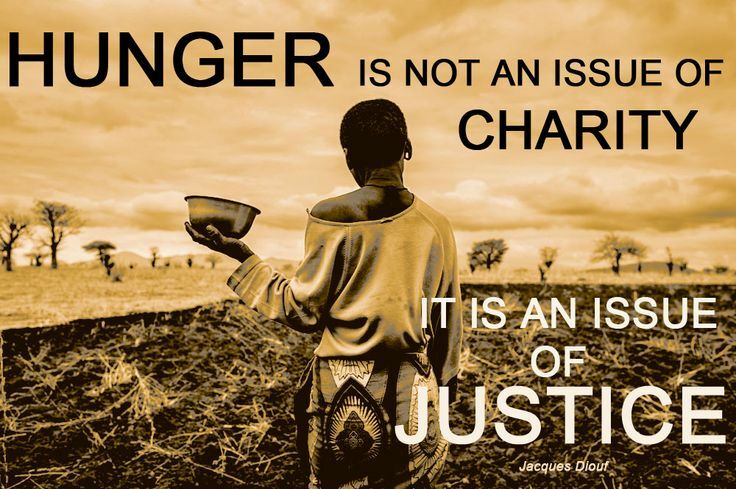 This entry was posted in Hunger & Poverty, Quotes and tagged charity, creation, food, hunger, Jacques Diouf, justice, planet on May 14, 2015 by Ray Buchanan. Gracious God and glorious Creator, as we celebrate Mother’s Day and give thanks for the love and care provided by our mothers, we recognize that your love and your care sustains all of us, and even this planet we call home. We give you thanks for your presence in our lives and we thank you for all we have received from our mothers. Yet, Lord, we know that even as we honor our mothers, there are millions of mothers who are not so blessed. Help us remember those mothers around the world this morning who face hardships and dangers we cannot begin to imagine. Be with mothers everywhere to lighten their burdens, provide relief from their worries and grant them rest from their unceasing labor. We pray especially for all those impoverished mothers around the world who are stalked by the shadow of hunger of hunger, those mothers who live in constant fear of famine and must fight every day just to provide enough nourishment to keep their children alive. The love those mothers feel for their children is no less than the love our mothers had and have for us. Be with hungry mothers and hungry children everywhere this morning. Help us honor them as we honor our own mothers. Let them feel your love, and let them be fed. Amen. This entry was posted in Hunger & Poverty, Prayers, Spirituality & Religious Writings and tagged blessing, care, children, creation, famine, God, honor, hunger, labor, Lord, love, Mother's Day, nourishment, poverty, relief, worry on May 10, 2015 by Ray Buchanan.